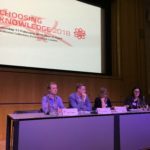 On the eve of our annual conference, Choosing Knowledge 2018, I thought it might be opportune to draw breath and look at where the arguments in favour of knowledge are? Basically, are we winning? The arguments surrounding Nick Gibb’s proposal to test 9 year olds on their times tables seems to have gone down pretty badly. The fur has been flying on twitter and some well known contributors to the argument for and against knowledge have ventured into unknown territory to declare their palpable hatred for Mr Gibb, national testing, mathematics and/or times tables and just about anyone who dares support the move to redress a national disgrace. When Andrew Old asked how can you solve a simple sum, simplifying 49/84 without the use of times tables, the responses were revealing. From “use a calculator” to “why do we need to know?” the responses just reveal a complete disdain for the teaching of mathematics. As one pundit put it, why do we need mathematics anyway, no one is going to use it in their normal life? The complete disdain with which abstract knowledge is treated by large swathes of the educational and teaching profession should not be underestimated. The argument is not yet won! Whether they baulk at testing or argue for child-centred discovery learning, we should be unafraid to take them on. What makes it worse is when they argue that knowledge is not for everyone. Some kids are too thick to get it. Dress it up how you like this one is raising its head in various guises from the return of IQ to the proponents of the evolutionary psychology. It even becomes an argument for creativity. We should develop kids natural talents rather than force feed them knowledge. This is why it is so import talk about knowledge and how to defend an education based on the generational contract in which adults pass on the best that has been thought and said to the next generation. For those of us committed to this, the constant reposing of the task allows us to repel the arguments of the naysayers. Whether they come from the technophiles and or the genetic determinists. I would assert all pupils deserve to be bathed in knowledge through their school years. Whether that be Latin or mathematics, no child should be seen as too ignorant or incapable of knowing enough to start on the journey to perhaps adding something to our knowledge in the future. Our job is to teach them what they do with the knowledge is up to them. It’s their world to inherit. Your efforts in promoting a knowledge based curriculum are appreciated. I am 60 and mainly self taught, especially regarding mathematics as my secondary education was poor and my own parents having little education. I am a great believer in “discovery” education and learning through play also, but not at the expense of formally teaching a subject to a high level, especially in the teen years. Whether or not humans “need” to be knowledgeable in a subject and how much they will use this knowledge as adults is unimportant. Humans, no matter what innate ability they possess in any subject, but especially mathematics, need to exercise and train their brains, especially during the teenage years. The human condition is not to give up but to persevere.